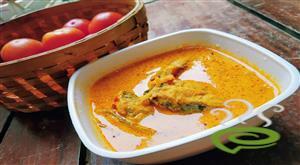 Kerala Karimeen Pollichathu is a ‘star’ dish very popular in top rated hotels and restaurants. 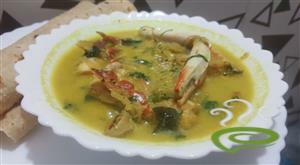 Native to Allepey, this Kuttanadan fish preparation is unique and interesting. Cleaned Pearl spot fish or Karimeen is marinated with a blend of rich spicy masala and baked in a banana leaf. A favorite delicacy in Kerala cuisine, Kerala Karimeen Pollichathu always makes you crave for more. Here is the Kerala Karimeen Pollichathu recipe you can prepare at home. 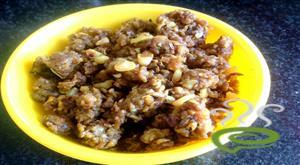 Sauteed shallot masala mixture is spread on a banana leaf and a partially fried Karimeen is placed on top. One more layer of spicy masala is spread on top of fish and the banana leaf is folded into a packet. Tied with a string, these fish packets are cooked in a kadai in slow heat for 10 minutes. 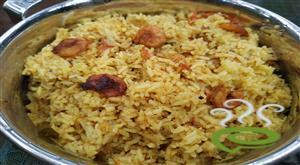 Enjoy the authentic Kerala taste. Check out the video for detailed recipe. Clean fish and make cuts on it. Mix pepper powder and salt, apply to the fish and keep for half an hour. Pour 1 tsp of oil in a fry pan and shallow fry the fish turning both sides. Keep aside. When brown, add green chillies, curry leaves and ginger-garlic paste and saute again till its cooked. Add coriander, chilly powder, turmeric powder and saute well. 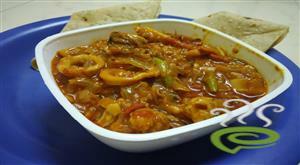 Add chopped tomatoes and mix well till its cooked. Add 1 tbsp of water and mix well. :- You can use cocount milk instead of water for a better taste. Divide it into 4 portions. Take a banana leaf and gently heat it to make soft. Keep one portion of the saute mixture on the leaf, keep the fried fish on top of it and spread one portion of the saute on the top of the fish. Cover the fish with the leaf and tie with a thread. Do the same with the second fish. Keep the fish in a kadai and close it with a lid. Cook it on a slow fire for 10 mins and gently turn it over and cook the other side. 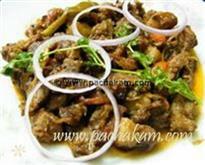 :- Serve Karimeen Pollichathu hot with chappathis or rice. Turned out really well. The suggestion to fry the fish with salt and pepper adds to the the taste. Wow, i made it first time but not with karimeen. It was soo good. My husband loved it. Keep it up. Used regular onions instead of small onions and it still turned out fabulous..Awesome recipe..
Used onion instead of shallots .Still turned out great.Great job..thanx for the awesome recipe. I made it for the first time and it turned out well.my children and husband loved it.